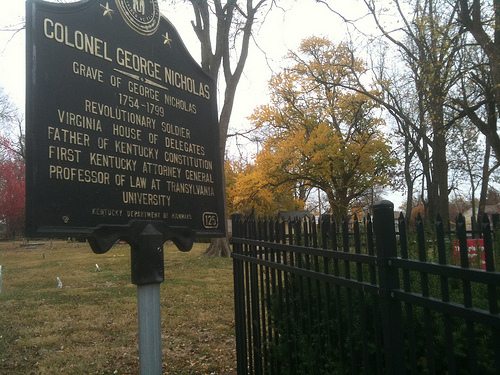 Col. George Nicholas Historic Marker - Lexington, Ky. The year 1780 was significant for Nicholas, his family, and his hometown. His father, a prominent attorney and political leader who had opposed the Declaration of Independence, passed from this life. Nicholas' hometown of Williamsburg lost its status as state capital. Nicholas, too, left Williamsburg. Heading west, Nicholas resettled to Charlottesville, Virginia. There, he befriended future President James Madison. In his new home, George Nicholas was returned to the Virginia House of Burgesses for several terms as representative for Albermale County. And though his father had opposed the Declaration of Independence, Colonel George Nicholas was a strong proponent for adoption of the Constitution when Virginia considered ratification at its 1788 convention. Once Virginia had adopted the new federal constitution, Nicholas and his country again looked westward. President Washington appointed Colonel Nicholas to be the first United States Attorney for the District of Kentucky. Under the Judiciary Act of 1789, Kentucky (a judicial district of Virginia consisting of nine counties) was designated as one of the thirteen original judicial districts. Washington's appointment of Nicholas occurred on September 29, 1789, and Nicholas dutifully followed his nation's call to Kentucky whereupon he settled in the then-seat of government: Danville. For seven years and through nine conventions, Kentuckians had sought statehood independence from Virginia. Now in Danville, Nicholas joined the call. A statehood petition was granted in 1791 and a state constitutional convention was called in April 1792 to prepare a constitution for the new Commonwealth. Five representatives from each of Kentucky's nine counties came to Danville to accomplish this goal. As one of Kentucky's leading legal minds, Colonel Nicholas was called upon to serve as chief draftsman of the document. For this, Nicholas is known as the "Father of the Kentucky Constitution." A great debate at the constitutional convention arose over the issue of slavery. Nicholas favored slavery and its legal merits, but at least one member of the convention resigned when Nicholas' draft included language that protected slavery. Found in Article IX of Kentucky's first constitution, the provisions prohibited the legislature from passing laws "for the emancipation of slaves without the [prior] consent of their owners" and a "full equivalent in money for the slaves so emancipated." Article IX did at least forbid the "inhumane" treatment of slaves and it also prohibited the commercial slave trade. Nicholas' constitution also lacked mention of taxation, education, or a scheme through which to amend the constitution. In today's Kentucky, this is hard to believe as we face an amendment to our state constitution on almost every visit to the ballot box. These deficiencies and the inability to amend led to calls for a new constitutional convention which was finally convened in 1799; this convention produced Kentucky's second constitution which was largely based on Nicholas' work. 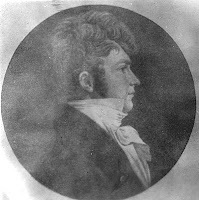 On June 15, 1792, Nicholas was appointed by Governor Isaac Shelby to serve as Kentucky's first attorney general. He stayed in this position for only six months before retiring from public life and to Lexington where he continued to practice law. In 1799, Transylvania University was established as such and with it came the first law school in the west; Colonel Nicholas was appointed as its first law professor. Colonel Nicholas died in Lexington on July 25, 1799, and he is buried in the Old Episcopal Burial Ground on Lexington's Third Street. Named after him are both the city of Nicholasville and Nicholas County.